Raising and lowering blinds or shades is typically a simple process. However, they can get stuck in their raised or lowered position at times, and no amount of pulling or finesse will make them raise or snap back into place. Fortunately, a few quick troubleshooting tips can have your window treatments working again in no time. If your blinds won't raise or lower, the problem is most likely due to a malfunction of the cord lock mechanism. Pull the cord all the way to the level of the headrail or header piece, which is usually stiff plastic, at the top of your blinds. Gently pull on the cord. If this does not release the cord lock mechanism, you will need to remove the blinds from the window. Depending on how they are mounted, you may need to remove screws or nails to accomplish this step. Identify the cord lock mechanism within the header rail. You will be able to tell which piece this is because the cords run through it. You should see a pin within this mechanism. Using great care and a flat-head screwdriver, turn the pin perpendicular to the headrail. Do not turn or move the cords as you do so. Next, push the pin in to disengage the cords. The slats of your blinds should lower. Test the cord lock mechanism a few times and, if it is working, rehang the blinds. If you find troubleshooting the cord ineffective, the malfunction in your blinds may be due to an internal mechanism called a pawl binding. This piece is located within the header piece. To troubleshoot the pawl, remove your blinds from the window. Once you have removed the blinds, look inside the header. The pawl is a spring-like piece close to the outer edge of the blind-locking mechanism. It should be situated within a track. If it is not, use a blunt tool to gently push it back into place. Replace the blinds and test them again. 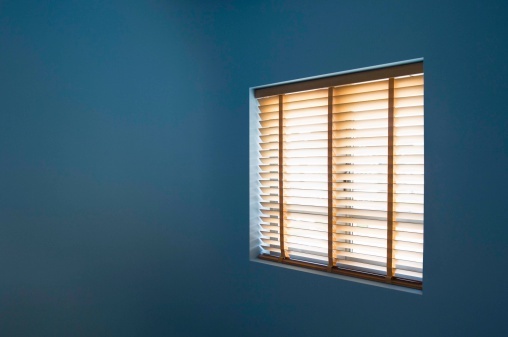 Typically, blinds differ from shades in that they use a string or chain to raise a series of interconnected slats. Shades, however, are smooth pieces of rolled fabric that snap up and down. If you find your shades are malfunctioning, you will need to proceed a bit differently than you did with your blinds. Inside each rolled shade is a small spring that controls the raising and lowering of the unit. In addition, how tightly or loosely this spring is wound dictates how quickly the shades go up or down. The first step in troubleshooting your shades is to check this spring, which is accessible from the outside via a pin. The pin is the small cylinder or rectangle of metal that hooks into the window's mounting bracket. To check it, unhook the shades from their brackets. Usually, one side needs to be removed before the other. Clean out any dust and debris surrounding the pin. Sometimes, accumulations of dust can make the pin stick and inhibit its ability to raise and lower the shade. After cleaning out this area, replace the shades and see if they begin to work. If the shades still do not work, remove them from the window once again. Attempt to tighten the pin by turning it to the right. You may need to use a pair of needle-nosed pliers. Turning the pin in this manner impacts the tension of the spring inside. You should replace the shades after slightly tightening the pin and trying to raise and lower them again. Continue this process until the tension is appropriate.